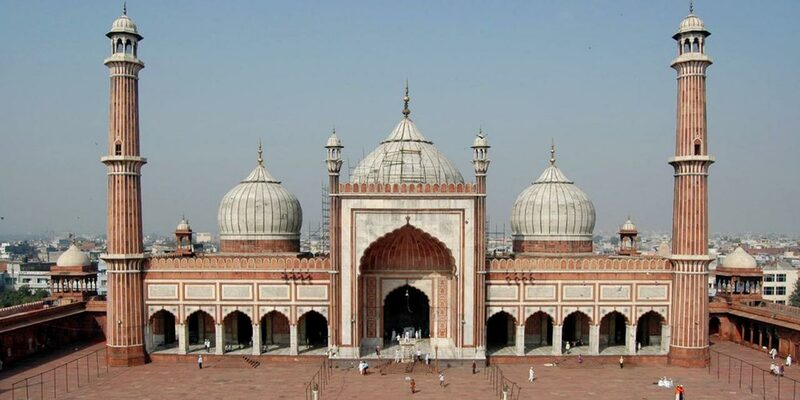 One of the popular sightseeing places in Delhi that you cannot miss, is Jama Masjid. A religious shrines, it is also popular for its impressive architecture. It is among the largest mosques in India. Jama Masjid Delhi is also known as the Masjid-i-Jahan-Numa, which means the mosque that reflects world. However, the name Jama Masjid is said to have arrived from the word jummah, which refers to the holy gathering of Muslims for praying. It is located in Chandni Chowk, which is another popular place to visit in Delhi, especially if you are a shopping enthusiast. Jama Masjid Delhi was built during the reign of Shah Jahan while its construction was supervised by the Saadullah Khan. The After demise of his wife, Mughal emperor Shah Jahan shifted his kingdom to Delhi and created Shahjahanabad, which is now referred as Old Delhi. In this new capital of Mughal Empire Jama Masjid was commissioned as the central mosque of the establishment. Jama Masjid was then built by Wazir Saadullah Khan while it was designed by the architect Ustad Khalil. It took 6 years for its completion, from 1644 to 1656. Around 5000 artisans are believed to have worked on creating this masterpiece. An amount of 1 million was spent on its construction. Jama masjid was then inaugurated in 1956, by Syed Abdul Ghafoor Shah Bukhari who was an imam from Bukhara (currently Uzbekistan). Jama Masjid presents an impressive architecture. It is built with red sandstone and marble. Consisting of 3 majestic gates, four towers and two minarets with a height of 40 meter, it faces west which is the direction of holy Mecca. There are three domes on the mosque terrace which are covered in stripes of black and white marble. These domes are encircled by the two minarets. With a capacity to house 25000 persons, the mosque has been built on an elevated platform and can be accessed by three gates. In the centre of the courtyard, there is a purification tank, which is used for washing hands and feet before the prayer. The mosque is consisted of a huge prayer hall with various entrances along with an altar for the prayer leader. There are also inscriptions with details of the mosque’s history and Shah Jahan's reign. Jama Masjid is well connected to rest of the city. The nearest metro station to Jama Masjid is Chawri Bazaar, which is only 500 meters away. It is also at walkable distance from the Old Delhi Railway station and ISBT Kashmere Gate. Auto rickshaws and taxis are also easily available here. Jama Masjid in Delhi opens from 7 AM to 12 PM and then again at 1.30 PM and closes at 6.30 PM. It is open on all days of the week. There is no entry fee to visit Jama Masjid. However, if one wants to click any photographs, they need to pay Rs. 300 as ticket price for photography.